decorated in the grotesque style. Antonio Neri's career in glassmaking took him from the city of his birth, Florence, to Pisa, Antwerp and possibly other places yet to be confirmed, like Rome and Venice. Under the reign of Grand Duke Ferdinando de' Medici, a glass furnace at Pisa became an important source of diplomatic gifts in both glass and ceramics. Antonio Neri worked at this facility in the first years of the seventeenth century. Later, the same foundry would receive an order for exceptionally clear glass to be used by Galileo in his telescopes. It is unknown how that project worked out, but the furnace master Niccolò Sisti made a name for himself supplying glassware to the Vatican, the king of Spain, and many nobles throughout Italy and Europe. 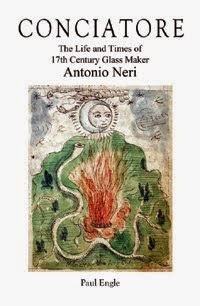 Undoubtedly, Neri's glass career was strongly influenced by his tenure in Pisa with Sisti. In the early seventeenth century, there were several glass furnaces in Pisa. One was run at the pleasure of Grand Duke Ferdinando by Niccolò Sisti. Raised in Norcia in Perugia, he likely learned his trade at an early age; Sisti's father, Sisto de' Bonsisti, was said to be an expert in making paste gems. This would account for the son's apparent skill in the medium of glass in addition to his ceramics prowess for which he was previously employed at the Casino di San Marco in Florence. For Neri, working at Sisti's glass house in Pisa played an important role in his glassmaking education. Sisti would serve three Medici grand dukes, Francesco I, Ferdinando I and Cosimo II. When work came to a stop at the Casino di San Marco, after Francesco’s death, Sisti may have opened his own factory in Florence for a short time, but then moved to a new facility in Pisa. In 1592, Grand Duke Ferdinando set up a glass shop in the central part of Pisa, along the north bank of the Arno River. This furnace was staffed by Muranese workers and was located in the city center, along the river. Archaeologists have unearthed its remains in the courtyard of what is now 43-44 Lungarno. The operation was capitalized with a loan of five hundred scudi made by Ferdinando I to Sisti, with a special mandate: he was to introduce new forms of pottery to the region. In addition to glass, the furnace at Pisa would produce soft-paste porcelain and majolica ceramics. These were both forms that Sisti had helped to develop when he worked in Florence at the Casino; he was involved in Francesco’s quest to duplicate Chinese porcelain. In 1602, Neri was to be found working alongside Sisti at the Pisan furnace. According to his own account, this is where he worked on special colors, and collected river stones for glass frit. Here he made kermes based paints, enamels and used ferns as an alternative plant salt for glass. In all likelihood, he would have had access to the nearby botanical gardens and the small adjacent laboratory located just a few blocks from the glass furnace. Early in 1604, the priest would make his trip north to Antwerp to visit his friend Emmanuel Ximenes. During Neri's seven year absence, Sisti's projects included cristallo table service for the Vatican, and special glass for the lenses of Galileo's telescopes. Upon Neri's return from Flanders, we again find him working in Pisa, this time on alchemy. In a copy of his last known manuscript, a heading reads, "Techniques copied from an old book here in Pisa." The university at Pisa was an intellectual center and a repository of technical knowledge. There, Neri had access to a wide range of materials in the libraries. The furnaces and laboratories provided him with hands-on experience, but there can be little doubt that he was a voracious reader as well. On the same page of this manuscript appears the date 26 January 1614. This is the last known specific information on the priest's whereabouts, since he would be dead within the year, at the age of thirty-eight. *This post first appeared here in a shorter form on 18 October 2013.